This is "Flaire's" first foal and what a beauty! Black, no white, up-headed, style- this gal has it all. She definitely has the "Special Flaire". 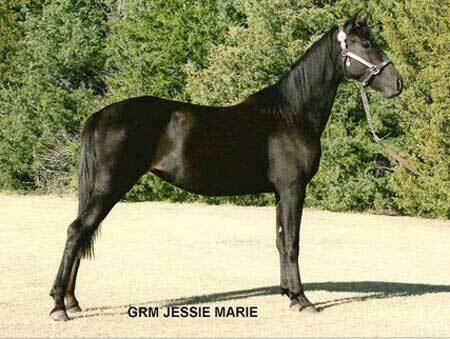 Windhover Regency is the Grandsire and Great-grandsire of this gal. Rimlo Black Valiant, Funquest Monarch, Caduceus Renaissance, and Caduceus Denver are all incorporated in her lines also. 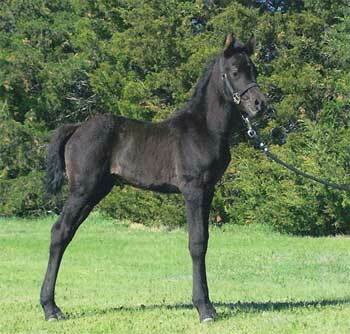 She possess the "Flyhawk trot" and should mature 15.2-15.3 hands. She was imprinted at birth, haltered at an early age, handled daily, & bathed.